A free seminar on ‘Art of Success’ was conducted , for aspiring civil services candidates, by Mr. A K Mishra, Founder of Chanakya IAS Academy , who is also fondly called ‘Success Guru’. Successful candidates of Civil Services Examination(CSE)-2017 were also present at the seminar. Later Mr. A K Mishra & Mrs. Gurneet Kaur, Centre Head, Chanakya IAS Academy, Chandigarh participated in a press meet. The event also saw few students of Chanakya IAS Academy, who successfully cleared the Civil Services Examination being felicitated by Mr. AK Mishra. Ayush Sinha (Rank 7), Abhilash Barnwal (Rank 44), Megha Arora (Rank 108) & Agam Singh Bedi (Rank 332) were honoured by Mr. A K Mishra. Mishra shed light on his unique ‘Art of Success’ seminar that he conducted at Chanakya IAS Academy in Sec 8 here. It is noteworthy that Mishra’s ‘Art of Success’ system is based on a trademark Model, ‘Human Software Development Programme’, which is a blend of Clinical psychology, NLP(Neuro Lingustic Programming), physiological study etc, aimed at bringing revolutionary transformation in Human Behavior. “The idea was to enthuse aspiring civil services students by giving them an opportunity to listen to the ‘Success Guru‘. As we have stepped into our silver jubilee year, we also announce a 3 years Integrated programme for CSE for class XIIth pass out students , the batch will commence from 20th July 2018.” Said Gurneet Kaur, Centre Head, Chanakya IAS Academy, Chandigarh. 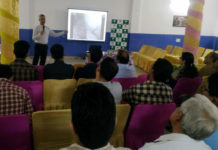 In fact under A K Mishra’s ‘Art of Success system’ are available specialized courses for people from all walks of life, such as; Art of Success for Parenting, Art of Success for Successful, Art of Success for Professionals, Art of Success for Aspirers, Art of Success for Teenagers, Art of Success for Human Relationships etc. “I am happy to have been mentored under the ‘Art of Success’ programme of Mishra Sir. This is what made the difference. The study and hard work one needs to put in to crack Civil Services is routine & has to be done, but what we learnt from Mishra Sir’s system really provided the edge we needed– a belief in one self that we could do it.” Said Ayush Sinha who attained Rank 7. It is pertinent to mention here that in Civil Services Examination 2017, the progress shown by the students of Chanakya IAS Academy was remarkable- 5 students came in top 10, 11 in top 20, 42 in top 100, in total 355+ selections took place from the Academy.